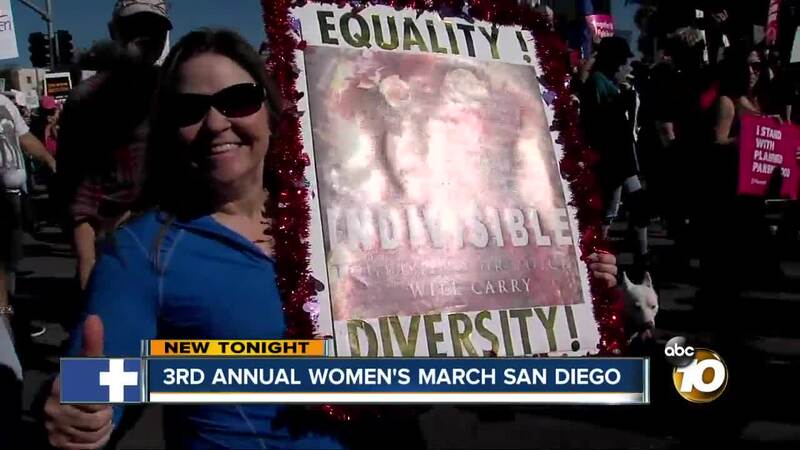 SAN DIEGO (KGTV) — San Diegans gathered Saturday for the third annual Women's March at Waterfront Park, alongside dozens of other national events taking place the same day. While this event is called the Women's March, many participants said this was not just about fighting for women's issues. "We stand against racism, antisemitism, homophobia, transphobia..." said one podium speaker. Assemblywoman Lorena Gonzalez Fletcher, Assemblyman Todd Gloria, and San Diego City Attorney Mara Elliot were some of the few guest speakers at the event. "It has become intersectional right? We care about all people, and I think that's indicative of women. We're mothers, and we know that these people could be our children," Gonzalez Fletcher said. San Deigo resident, Carmen Cutter said she is most passionate about women rights, climate change, the humanitarian crisis at the border. "We're just human, and we care about what happens to our planet, what it means for the next generation," Cutter said. This includes her 13-year-old son, Lucien Escarguel. He said he personally wanted to march, not just to join his mother, but because he wants to be part of the change. "I hear a lot of sexual assaults toward women, and I don't think that's very nice, and their body should be respected," Escarguel said. He said he learns a lot about social studies and politics from his history teacher at Lewis Middle School. Escarguel hopes to see more boys and men join the march in the future, to show that they are in this together. "I think that just because you’re not of the same gender, and you weren’t assaulted, and you don’t have personal experience with those crimes, that doesn’t mean you can’t come," Escarguel said. "I haven't been offended at all, but I feel bad for the ones that are offended, and they need help, and I need to show support to them." This year's marches have been under recent criticism over comments made by Women's March co-founder and co-chair Tamika Mallory. The group has been questioned over its association with Louis Farrakhan, the leader of the black nationalist Nation of Islam. Recently on "The View," Mallory sidestepped a question by show co-host Meghan McCain regarding Farrakhan's anti-Semitic statements, such as "the powerful Jews are my enemy" and warning of satanic Jews during his 2018 Saviour's Day address. "In regard to issues concerning antisemitism, Women's March San Diego does not condone language or actions from any person or group that target, disparage, denigrate, threaten, or harm another person or group," the Women's March San Diego said in a statement online. "Since our inception, Women's March San Diego has oriented our mission of harnessing the political power of diverse women and their communities toward creating transformative social change." RELATED: Scenes from 2019 Woman's Marches around the U.S.